This is the book that made it happen: the nationwide revision concerning the man who they tried to tell us was a great liberator. This is the book that made it happen: the nationwide revision concerning the man who they tried to tell us was a great liberator. Dictator and slayer of liberty is more like it. Lincoln was not the godlike figure of myth and legend but an unusually cruel political operator who exploited the moment for personal gain, just as we've come to expect of modern politicians. In this blockbuster, Thomas DiLorenzo calls for a complete rethinking of a central icon of American historiography. He looks at the actions and legacy of Abe Lincoln from an economics point of view to show that Lincoln's main interest was not in opposing slavery but in advancing mercantilism, inflationism, and government spending: the "American system" of Henry Clay. Through extensive historical investigation, DiLorenzo shows that the high tariff pushed by Northern industries, at the expense of Southern agriculture, was the main cause of the sectional conflict. Further, Lincoln's goal in preventing Southern secession was the consolidation of federal power and the collection of revenue, not the elimination of slavery. Introduction by Walter Williams. Barron's says: "More than 16,000 books have already been written about Abraham Lincoln. But it took an economist to get the story right. The Real Lincoln, by Loyola College economics prof Thomas J. DiLorenzo, is this year's top pick in [Gene Epstein's] sixth annual review of Holiday Gifts that Keep on Giving, When It's the Thought that Counts." I thoroughly enjoyed this book. This is a must must-read for people in the pursuit of life-long learning. The real learning occurs after the State mandated education ends, and this book is a testament to that fact. Professor DiLorenzo’s comparison of King George III’s “train of abuses” cited in the Declaration of Independence with Lincoln’s illiberal dictatorial actions is truly brilliant. I totally understand the current members of Lincoln’s Tribe’s (the neo-conservatives) negative reaction to Professor DiLorenzo’s book. When you look at Statism without propaganda enhanced lenses it’s not very pretty, and most definitely not American. Thank you Professor DiLorenzo for this wonderful tool to enhance my BS filter. It is extreme in it's view without any attempt at balance. Does not address the moral stain of slavery, but seems to consider it a pragmatic economic reality. Lincoln should not be considered  beyond human frailty but he certainly should not be disdained for fighting a war to preserve the union. 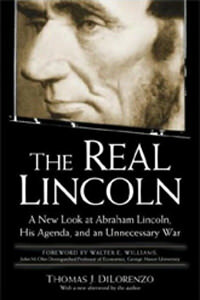 The truth of Lincoln lies somewhere between DiLorenzo's and Doris Kerns Goodwin's   Portrayals. A warning to those who idolize Lincoln. This book will force you to re evaluate what you were originally told about the Great Emancipator. Dilorenzo has done a great job in using reference material for his statements and if you really want the truth you owe it to yourself to check theses references. I even went so far as to purchase a copy of the Declaration of Independence and the US Constitution just to make sure that the author wasn't just 'nit picking' or writing like a sensationalist to sell books. Everything Dilorenzo writes can be verified. This is a 'must read' for students of history. It truly shows what a tragedy the American Civil War was and how it could have easily been avoided were it not for the centralist ideas of a president who literally stepped all over the Constitution. All in all - a great book. As a Black man I have enough intellectual honesty to see that Mr. Lincoln did trash the constitution in order to consolidate the country. However I also ask you to have enough intellectual integrity to understand that the pox of slavery upon my ancestors (lost to unmarked graves) is still extant in degradation and jails and low test scores. How much longer would slavery have lasted without the war? Who can say? The war ended it - mostly. I really would like to have 40 acres and a mule, just to see whether I could have made it. Something really great happens to a man and his family when they are introduces to freedom and hard work. Proven by the McCoy, Garrett, Lattimer, Just, Drew and many others who were able to break out of the stereotypical and move forward into invention and education. Excellent book.....Lincoln paved the way for the Great Leviathan Government we now wrestle with. He was not "the great emancipator" as americans are brainwashed to belive in our government-run public schools...but the first American Dictator who trashed the constitution in order to "save it". My children will be required to read this book. This fiery book goes far more into depth than his first blockbuster on the subject.